The other day I rediscovered my mother's last letters to me. I was on a search for something else and stumbled over them. No, to be honest I didn't stumble over them because I knew they were there all along. I just hadn't been able to read them for a long time. I've kept those three letters from Mom in a little box on a table in my bedroom. They've been there since she died nearly twelve years ago. Just after her death I read them often. I would shake but I couldn't cry. I kept my grief in tight check for I feared if I did cry it would break the dam overwhelming everything and I'd cry until I too died. Her loss had been more than I could bear. I functioned quite woodenly for a very long time after she was gone. The first of those three letters was written July 23rd; just two weeks after Dad had died suddenly of a heart attack at age 58. It had been less than a month earlier that they had moved into their new house on my dad's birthday. That letter wasn't much more than a note, but I know the effort it took her to write it. In it, Mom told me of her wait for the handyman to install the television aerial before going off to the lawyer's office to finalize some details. She spoke of her wish to escape the house and her grief and her hopes of searching for work. She mentioned her friends and their dilemmas. Then she wrote of her love for us. The second letter was slightly more than a note. It was dated September 15th, just before my 6th wedding anniversary. This letter began with news of the weather that signified that she was going to try to fill the page as best as she could. It was hot that year in Florida. Mom hoped that this year my wedding anniversary would be a special one, perhaps a dinner out or something like that. She told of visits to the local area Elks and Moose Lodges that her friends had taken her to and lamented over how 'old' everyone seemed to be. Florida for a 51 year-old widow isn't always appealing. Mom fretted over her lack of health insurance and was still working on procuring it along with a job. She was getting antsy in that new house that she and Dad had built seemed more of a tomb than a gift. She didn't write it, yet it was there between the lines. She wrote about a neighbor's grapefruit grove where the neighbor also kept his horse. His name was Beau. Mom would flee that house and spoil the horse with treats. Again, she wrote of her love and how she missed us. She even made a joke over how rotten a letter-writer she was and asked me to suffer with her. Mom's last letter was written the day before Thanksgiving that year. She began with thanking me for my letter to her. By then, she had found a job. It wasn't anything like the normal, Office Manager, positions that she'd held for so many years but it was office work. The letter didn't say and I used to know. It was either in a lawyer's office or an insurance office though—in the clean-up detail. Mom was great at that. If there was a problem, she'd plunge right into it and fix it. Mom talked of readying Thanksgiving dinner and was glad not to be alone. She spoke of how strange it was to see Christmas lights and decorations when it was still warm outside. She still hadn't acclimatized to Florida. There was her little granddaughter, Mandy, whom she would be babysitting so my sister Melody could work—Melody always works. Then Mom wrote about a party that she would be attending and laughingly noted that "You Know Who" had to fix the vege-tray. Mom always had to, but she was great at it. Mom said she was looking forward to Christmas. For Christmas she was coming home and I couldn't wait. Christmas didn't turn out to be such a good time after all. During the holiday season, my grandmother, Mom's mother, took ill with a speedy cancer that killed her. She was the last of my grandparents to go. Mom, who was still reeling from Dad's sudden death, dealt with her mother's passing. She managed, but just. While it hurt me very much to lose my grandmother, I recall being so totally focused on my mother's welfare I know I didn't give my grandmother her due. 1100 miles away from me, Mom was back in Florida after her mother's funeral struggling to make a life for herself. She had her new home, her new job, some old friends and some new friends, and it all still felt alien to her. She was out of synch. She was striving so hard to make good things happen when everything still felt false and stilted. In the space of those short few months things happened quickly. Mom decided that we kids were 'half-orphans' and she would do her best to see that she was going to be around for a long time. She decided to go on another diet and be a health nut. Back in the late '80s, the fad was a Vitamin A ritual. That meant little in the way of food and lots of pills. Mom lost 35 pounds and didn't look good even under her tan. That diet killed people. She was frenetically cheerful. It belied her obvious pain. She was still struggling with personal devastation and now physical discomfort. Tears would attack her and black depression would wrap her tightly and she would become uncommunicative for days at a time. That following May, Mom came back home for our other sister's wedding. All was happiness and light—except Mom didn't feel well. She complained of pain and she didn't look healthy. She smiled too much and laughed too hard. 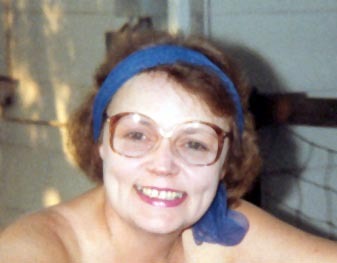 Mom died July 11th, 1988. It was sudden enough, less than 30 days. She was only 51. During that last year and 6 days since Daddy had died, it seemed that Mom had foundered hard. It wasn't that she didn't try to deal with her grief and overcome it; she did try. Yet her protective cover and mainstay had been stripped away. She was a woman dancing out on the high wire without a net. When her illness came upon her she didn't have the strength or heart to fight on. It wasn't that she wouldn't fight to stay with us. It was that she felt she could leave us. Her mothering days were behind her and we were grown. She had given us her best and brightest. It would have to be enough. When I read those letters again, nearly twelve years had passed. I had shelved them for almost ten years. They had been too painful to read. I never thought I'd be able to read them again without the pain, without the burgeoning tears, and without a great sense of anger over my loss and the unfairness of it all. Time heals. Sometimes it takes a great deal of time to make that happen. Even with her pain on and between the lines, her letters were a gift to me. They often spoke of mundane things but they were from her as something I can keep as she reached out to me and I cherish them. I love you Mom and I'll miss you forever.